/ Laser beams illuminating unit of Diode Pumped Green Laser. To transfer information, it's common to modulate the brightness of the laser light. For a laser diode, this is done by varying the electrical current supplied to the diode. But it doesn’t matter how quickly you can vary the current; the laser will respond in its own sweet time. Overcoming that limitation traditionally involves turning the power up, but this new approach avoids that requirement. To understand this idea, we need to review several concepts. So buckle up and prepare to ride Chris’ concept rollercoaster. 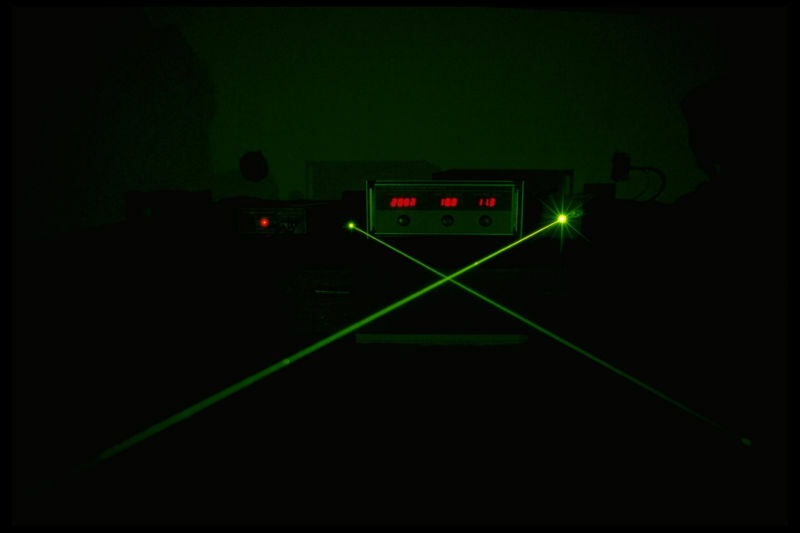 The lasers in telecommunications are made from semiconductor crystals. The speed at which light travels through a material is modified by the material’s refractive index. Air has a refractive index that is just a whisker over one. Glass is about 1.3, and semiconductors are typically around three to four. That means the speed of light slows down by a factor of three to four, while the wavelength contracts by the same factor. However, crystals are not perfect. They often have strain that distorts the crystal structure. This means that an electric field along one direction will experience a slightly different refractive index compared to an electric field that is rotated 90 degrees. And photons have electric fields. Imagine two photons traveling together through our strained semiconductor. One has its electric field oriented horizontally, and the other vertically. They start out perfectly synchronized with each other, but after a short distance they are no longer in sync because one photon is traveling slightly slower than the other. From the perspective of a viewer looking down the barrel of the photon gun, the electric field appears to trace out an ellipse. If we pass a stream of photons through a polarization filter, which blocks certain orientations, the intensity of the output beam will fluctuate as the electric field traces this ellipse. The rate of fluctuation—how quickly the ellipse gets traced—depends on the difference in refractive index for horizontal and vertically polarized photons (called birefringence). The bigger the difference, the faster the fluctuations. This has been known for a long time and is generally considered an annoyance. But remember, fluctuations in brightness can be used to carry data; the question here is whether we can turn this annoyance into something useful. To use this system to carry information, we need to control the rotation of the ellipse. That means controlling the number of photons in each polarization. The polarization of light that is emitted by an electron in a laser diode is given by the change in spin as the electron loses energy. So an electron enters the diode spin up, emits a photon, loses energy, and flips to spin down. Likewise, a photon that enters the diode spin down will emit a photon, lose energy, and flip to spin up. The balance between spin-up and spin-down electrons determines the polarization of the emitted light. To encode information, the balance between spin-up and spin-down electrons that enter the laser diode should change: say from 75:25 for a logical one to 25:75 for a logical zero. The resulting light polarization would fluctuate as fast as we can switch between these two balance of spins in the electron current to the laser diode. Therein lies the next problem. The electrons don't immediately lose their energy. Instead, many of them hang around awaiting inspiration before doing so. These tardy electrons smear out the sharp modulation that we put into the laser, and this limits the data transfer rate to speeds that we can already achieve with current technology. Hence, we might put in a stream of electrons that are all spin up. A few of them emit immediately, but the rest first bounce around losing their spin orientation before they emit. The result is a background of light that contains no information, and, on top of that, weak flashes that carry information. To get higher speeds and clear signals, we need to force the electrons to lose their spin orientation very quickly. This happens naturally when the electrons bounce off the imperfections in the crystal. To get things to flip spin quickly, the researchers used a laser diode that was… a bit poor. The time that a spin-polarized current would stay polarized was really small, meaning that spin flips happen quickly. The researchers attached the laser diode to a cantilever and bent the cantilever. That stressed the laser diode along one direction, changing its refractive index drastically. The researchers showed that they could drive intensity oscillations at up to 200GHz, which is an order of magnitude better than previous results. Sending information is another story, though; the researchers couldn’t directly test that. Instead, they used their experimental data to model the laser. With that model, they could see how changing the spin orientation of the injected electrons would change the output of the laser. They showed that for modulation speeds up to 200GHz, information was encoded—in the words of telecommunications engineers everywhere, the eyes were open. This research will revolutionize short-distance network traffic. Not only do data rates go up, but energy per bit goes down by over an order of magnitude. There is, however, a small issue. At the moment, I don’t think there is a single device on the planet that can modulate the spin orientation of an electric current at 200GHz. Photodetectors at the receiver may also need some attention. But those developments are only a matter of time once the underlying technology is available. Sun 29° Aries 02' 02"
Moon 27° Libra 53' 48"
Mercury 02° Aries 40' 35"
Venus 28° Pisces 26' 12"
Mars 12° Gemini 35' 50"